My part in this comes up May 21 with a tale called “The Winning,” originally published in the print-only OVER MY DEAD BODY for Spring 1994, but presented here as reprinted in ezine A TWIST OF NOIR, December 9 2008 (see also below, June 11, May 6 2014; February 18 2012), a psychological horror flash piece of sorts of how a winner may yet become a loser. For this and others, the earliest in descending order by date, the later ones in the course of time, one can find the SMFS blog by pressing here (whereupon click on “Int’l Short Story Month” on the left, then scroll down the middle to the date/story of choice). Also Jay Hartman of Untreed Reads Publishing has announced a 50 cent sale for stand-alone short story chapbooks for May, including my titles PEDS, I’M DREAMING OF A. . . ., and VANITAS, as well as a discounted price on the New Years Eve Horror anthology YEARS END, all four of which can be reached by pressing any of the first three books’ pictures in the center column. Some of these discounts are also available from DriveThruFiction for which (along with a few other publishers’ titles/stories by me — and even two or three that are not! ), one may press here. The buzz is out, that Dave Gammon’s review of SPLATTERLANDS (see April 14 this year; December 4, November 22 2013, et al.) on HORRORNEWS.NET gives, if not a literally blow by blow, a story by story précis of its contents. But that isn’t all. Following that rundown Dave adds his own comments, exploring the subgenre as regards SPLATTERLANDS in some depth (including, to be sure, the warning: it’s “not for the faint of heart”), concluding that not only is the book a, um, bloody good collection of horror, the stories in general display a conciseness combined with power that shows off short fiction at its best. 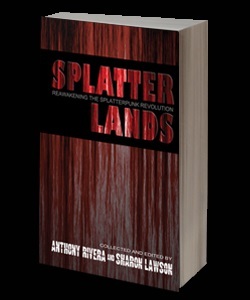 SPLATTERLANDS, it should be added, is edited by Anthony Rivera and Sharon Lawson. But don’t take it from me. For this and more, one need but press here.